Welcome to the IYT 24M ICC Theory course for coastal and inland waters - International Edition. This online course contains information required for inland waters endorsement for which a CEVNI exam must be successfully completed. The course also includes information required for VHF-SRC certification. The VHF-SRC exam must be successfully completed as part of the onine course. Candidates who already hold a recognised VHF-SRC Certificate do not have to receive the final IYT VHF-SRC Certificate, however, the training is part of this course and must be completed. Students must hold a recognised VHF-SRC Certificate in order to obtain IYT's 24M ICC Certificate of Competency. The information contained in this course is provided free of charge in order to promote international boating safety, To take the free course and gain a thorough knowledge of the information required to obtain an IYT ICC, you simply need to register with IYT and pay a $0.00 invoice which you will be prompted to do. Please make sure you wish to obtain the certificate for "inland waters" endorsement before taking this course. If you do not need an inland waters endorsement but plan to use in coastal waters only, go back and choose the course named "24M ICC Theory Course - Coastal Waters - International Edition". Pay the $150.00 USD fee by credit card or paypal. Complete this ICC theory E-Learning course which includes VHF-SRC, all quizzes within the course and the final theory examination. When you have successfully completed all of the steps noted above, you will be able to print the ICC and Marine Communications Master VHF Short Range Course completion certificates (pdf version) and/or refer to these certificates which will appear on your IYT account profile. You may then select the IYT school of your choice for the final practical training and examinations. 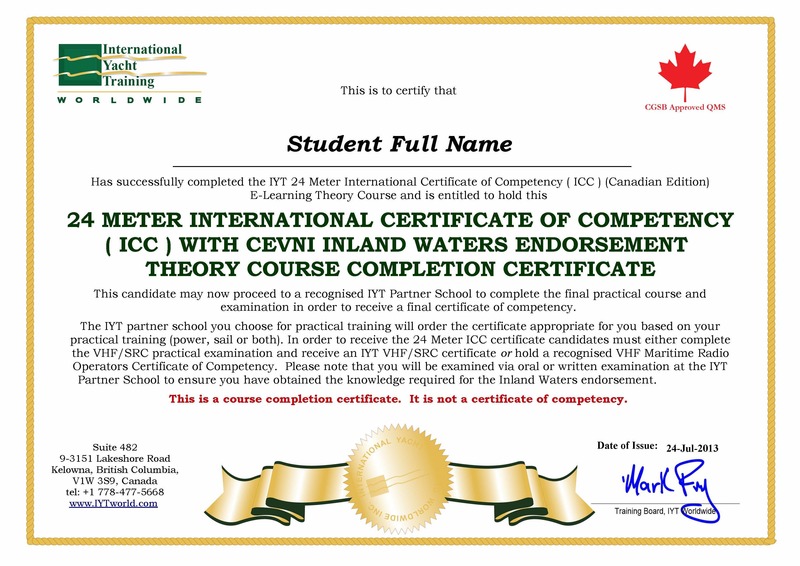 IYT requires practical proof of competency by one of our IYT Approved Partner Schools. Very important: The final examination fee is determined by the school. IYT does not dictate what a school charges its students for courses or examinations. This is an additional fee paid to the school for their time training and administering the examinations. Upon successful completion, the school will place an order with IYT for your final credit card style ICC and Marine Communications Master VHF Short Range Certificates. Some candidates may choose to only receive the course completion certificates and not proceed to an IYT school for the final ICC and VHF-SRC Certificates for which there will be no refund.